Here is an article I wrote about CITES CoP 12 for Diving Trade International, published January 2003.…………………………. Worldwide protection agreed for two species of sharks’. LANDMARK VICTORIES to protect two species of giant sharks were won at a U.N. convention Friday, frustrating the shark fin industry and encouraging conservationists. The Shark Research Institute, a non-profit based in Princeton, NJ, helped win worldwide protection for two species of sharks. 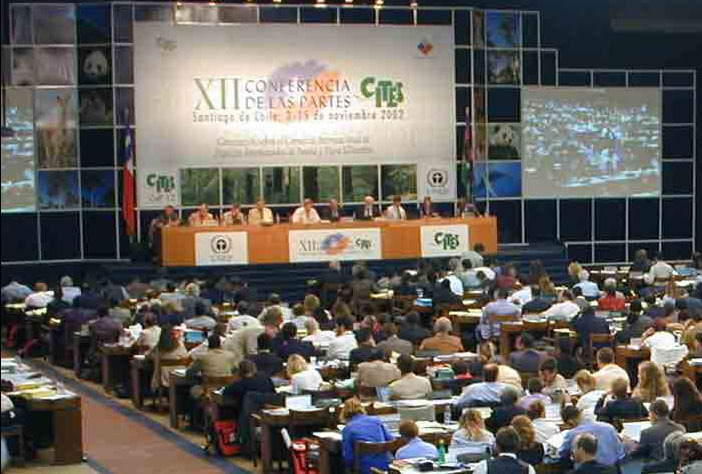 The Convention on International Trade in Endangered Species (CITES), a United Nations Treaty Organization, convened in Santiago, Chile, November 3 to 15, 2002. It was attended by 1,200 participants that included delegates from 160 member nations, and observers from conservation organization and special interest groups. A number of landmark agreements resulted, including protection for two species of sharks. India and the Philippines proposed Appendix II listing of the whale shark, and the United Kingdom and Northern Ireland proposed the basking shark for Appendix II listing. (Appendix II listings do no ban international trade, but instead require member nations to take steps to ensure that trade is not detrimental to wild populations). Both listings, defeated earlier in the week by narrow margins, we brought up in the final hours of plenary and received the required 2/3rd majority for acceptance. Parties supporting the whale shark listing included Australia, Bahamas, Canada, Costa Rica, Denmark (on behalf of the Member States of the European Union, Ecuador, Germany, Honduras, India, Madagascar, Mexico, The Philippines, Romania, as well as observers from IUCN, TRAFFIC, Shark Research Institute, WildAid and Swan International. Opposed were: China, Greenland, Iceland, Korea, Malaysia, Singapore, and observers from the Singapore Shark Fin and Marine Products, Ltd, and the International Wildlife Coalition. The basking shark, another giant plankton-eating shark. is also hunted for its meat and fins. Parties supporting listing of the basking shark included: United Kingdom, Ireland, India, New Zealand, Tunisia, and observers from IUCN and Humane Society International. Opposed were: China, Iceland, Japan, Malaysia, Norway, and an observers from the High North Alliance. A number of other marine species received CITES protection. The trade in seahorses will now be regulated for the first time. Seahorse populations have declined dramatically in recent years due to commercial trade, bycatch in fisheries, coastal development, destructive fishing practices and pollution. At least 20 million seahorses were taken from the wild in the early 1990s for traditional medicines, aquarium pets, souvenirs and curios. All 32 seahorse species are now listed on Appendix II. Japan’s proposals to circumvent the International Whaling Commission and down-list two species of whales, Minke whales and Bryde’s whales, from Appendix I to Appendix II were defeated. The delegates also agreed to set a zero quota for commercial trade in the Black Sea population of bottlenose dolphins, which were already listed on Appendix II. The population of these dolphins has declined significantly in recent years due to hunting, pollution and other stresses. “The key to global wildlife conservation in the 21st century will be to craft solutions that meet the specific requirements of each species and its specific circumstances,” said Willem Wijnstekers, Secretary General of CITES.